Amana's finest cuts of pork and beef are available in one great pack and are sure to please the most discriminating palate. 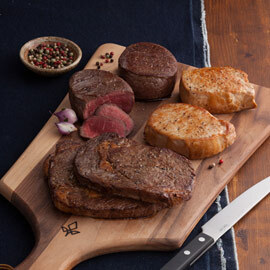 You'll receive two of each cut, making this assortment ideal for candle-lit dinners or to give as a special "thank you." This is a favorite of our family's and it's always delivered in perfect condition, and cooks up to delicious perfection. I've had trouble with UPS - their customer service doesn't hold a candle to Amana's. It's hard to find quality smoked meats these days but Amana has it nailed. Thanks! I sent a gourmet meat package and smoked bacon to my brother as a wedding present. He was delighted and commented on how good the pork chops were. He is excited to try the bacon and other items. It came in a couple of days (out of state) even though travel has been bad during this winter weather. Communication between Amana Smoke House and us was great. I definitely recommend products from here. It is a great gift for those who have everything and like good food. Gift boxes were sent to my Sisters in Mn. They were very pleased with the steaks and chops. I have been sending each of our children a summer grilling "package" for the past 9 years. It is a welcome treat to kick off the season. They absolutely love the beef and pork variety. Amana Meat Shop has several nice assortments available, and I mix it up each year so they never know exactly what they are going to get. The quality is excellent - the kids love it! Delivery process is quick and easy as well. 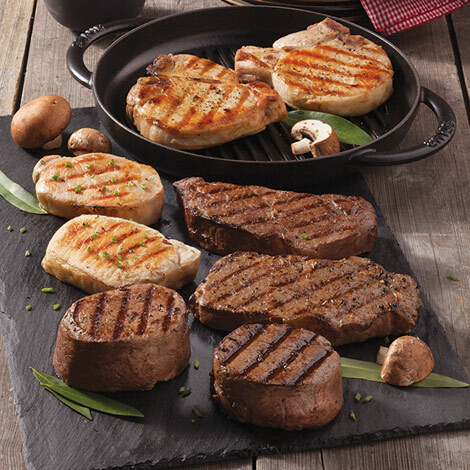 The perfect grilling combination for the delicious meats from the famous Amana Meat Shop located in Amana, Iowa! I've never been disappointed with the offerings of the Amana Meat Market! I've been both recipient, and gifter, and the quality and value are unmatched. A national treasure! Thanks! I received word back from my family that received this gift pack, and they did nothing short of rave about the quality of the meat included in the pak. I knew it would be good since it is an Amana product, but from their comments, it was beyond good. It was outstanding. Thank you! 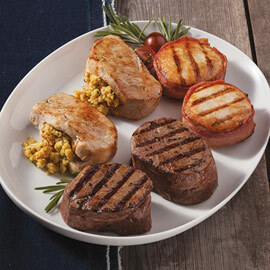 We received another fantastic combination of meats and have devoured half of the assortment! Amana Response: Thank you so much for your business! We always enjoy sending Amana right to your door! 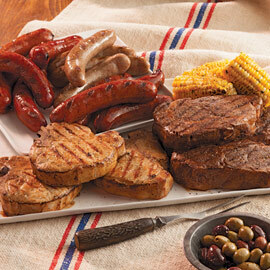 Perfect collection of various smoked meats for an awesome grilling party or dinners! The smoked flavors are incredible and the quality is superb from the finest meat shop, located in Amana, Iowa! Amana Response: Thank you so much! We appreciate your business and are so glad you enjoy Amana Meats! Meat arrived very quickly and in good condition except two of the packages had air in them and was not sealed very good. Kept these out and used the next day but rest were okay. Loved the pork chop. Grilled this and was very tasty. Loved the seasoning and have used it in many dishes. Like the fact that each piece is marked so you don't have so many boxes in freezer. Amana Response: Thanks for the feedback, Marie. Occasionally during the shipping process, the tight seal around the pork chops does loosen. Glad you were able to prepare and enjoy right away. Please contact us if you ever have questions on the products or packaging when you receive an order from us. We hope you enjoy all of your Amana Meats! I have use Amana Meat Shop products for Xmas gifts for years. 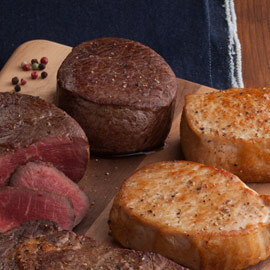 The quality of the meat is always outstanding and customer service is exceptional. Everyone I've sent their products to has raved about how delicious they are. The His & Her meat package I ordered was a gift to a friend in Iowa City. He was thrilled with it, saying there is nothing better than Amana meats. This is my go-to gift for friends and family out of state, who like good meat. I have always gotten great reviews from the recipients on the quality of the product. The items come packaged in 2s, which makes it perfect for a couple. For help and tips on preparing these Pork Chops, Beef Filet Mignons or New York Strip Steaks, see our Cooking & Serving Instructions. Tip: Try our All Natural Seasoning. A perfect balance of flavors that pairs well with beef or pork.